Raised garden beds present a great way to add diversity to the landscape of your allotment or garden, allowing you to create any selection of tiered bedding areas for particular plants and vegetables or flowers and fruit. Adding a unique touch, these beds can be created in any arrangement, any size and height to achieve the perfect growing area for any selected crop. A raised bed which is two or more sections high is much easier on your back, particularly for those mundane daily chores like weeding. They're also better for deep-rooting crops - See our guide table below for how deep to make your raised beds. With optional cloche hoops, our raised bed kits are great for propagation so you can sow your seeds straight into your raised beds. Or if you want to get a few weeks headstart you can propagate your seeds indoors and transplant the seedlings to your raised garden beds, with cloches for protection against the weather, frost and pests. Gradually acclimatise your seedlings by raising the polythene cloche cover during the day and closing again at night time. For our range of Raised Beds, we use 145mm x 45mm timber - Thicker than most to easily withstand the pressure of the the soil. It's also tanalith treated to ensure they don't rot for a good few years. The timber that we use has rounded corners - Not only is it safer but it looks good aswell. 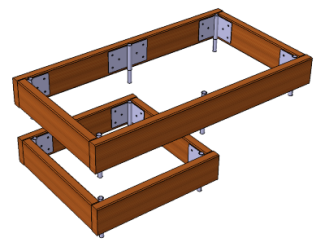 Our Raised Bed brackets are designed so that the raised beds will stack on top of each other. Each bracket has a tube with a reduced end which will push into the ground on the bottom tier or will locate into the tube of the bracket on the previous tier. Our brackets are hot-dip galvanised for maximum resistance against corrosion. 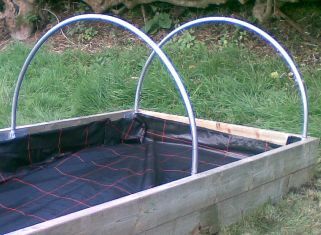 Our Raised Beds have the option of integral cloche hoops. The hoops have swaged ends which slot straight into the Raised Bed Brackets. The hoops are manufactured from the same high tensile galvanised steel tube as our polytunnels, diameter 25.4 x 1.5mm wall thickness, grade Z35. The polythene supplied with our Raised Bed Cloche Kits is the same specification as we use on our polytunnels. The polythene film is secured at each end with an elasticated hook tie. This keeps the polythene under tension when the sides of the polythene are raised for ventilation. We also supply rot-proof polyester cord to loop over the inner hoops. This holds the cover securely in place if the weather gets windy. Our Raised Beds are available in a range of sizes: Widths are 890mm, 1290mm and 1890mm. Lengths are 1260mm, 1800mm, 2400mm, 3540mm and 4680mm. Our range of lengths may seem a little unusual but these sizes have been carefully designed so that different length beds will fit on top of each other. Why? Well, an ideal example is if you want to build your raised bed on sloping ground. You can start off with a shorter raised bed, set into the hillside and fit a longer raised bed on top of it. The length of each bed (except the 1800mm long raised bed) has been designed so that the joining brackets will slot directly on top of each other. This also allows you to stack a shorter raised bed on top of a longer section - ideal for creating an attractive garden feature. How Deep . . . ? How deep should my raised beds be? Below is a list of our suggestions for the depth of your raised beds. Remeber that you're likely to rotate your crops and so it's wise to plan for the deepest rooting crop that your likely to grow. The list isn't definitive and should only be taken as a guide. How should I fill my Raised Beds? There's no set rules about how or what to fill your raised beds with but we'll try and give you a few ideas and suggestions. The first thing we recommend is to put down a layer of weed control fabric. The indiginous weeds already in the ground where you intend to site your raised bed will welcome the fertiliser that you use to grow your vegetables and in no time will have put it to good use in making themselves strong and healthy. By putting down a weed suppressant fabric you'll keep them at bay for a good few years. You might want to consider the drainage of your raised bed. Is the existing ground heavy and water-logged? Is it sandy and free-draining? A way to aid drainage of your raised bed is to put a layer of aggregate (large gravel) under your raised bed, a couple of inches deep. Remember though, your raised bed will usually drain well because of its elevated position. 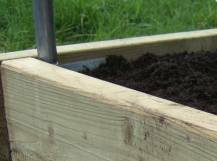 To ensure your raised beds are fertile it's a good idea to mix some well-rotted manure in with your compost or topsoil when you fill your beds. You can fill the beds right to the top as the compost will settle over time. Finally, check the pH level of your soil and add a sprinkling of lime if it's too acidic.